In a way to get around the gun laws in Russia, gun manufacturers have created a new gun and cartridge designed to allow gun owners to have the accuracy of a rifled barrel, while still having guns that fit in the smooth bore category. The idea of .366 TKM cartridge was accepted really well in the Russian shooting community. What makes it unique for them is that firearms chambered in this caliber have partially rifled barrels which qualify as a shotgun in Russia and don’t require 5 year wait period for the first-time gun owners to obtain a rifled firearm. That rifled portion (about 135mm or so) is considered a built-in rifled choke (a.k.a. Paradox choke). In other words, they can buy these sort of small caliber slug cartridges and guns right off the shelf and still have somewhat rifle grade accuracy and power at moderate ranges (100 to 300 meters). In the video below a camera travels down the .366 TKM barrel (starting from the muzzle). Note how riflings start to disappear at some point and the bore becomes completely smooth. According to Molot officials, the 9.6x53mm Lancaster works at higher pressures compared to the .366 TKM, that’s why having a built-in rifled choke with conventional riflings would generate dangerous pressure increase where the bullet engages the riflings. They say, that the Lancaster oval bore is more suitable to handle the higher pressures of the 9.6x53mm cartridge. 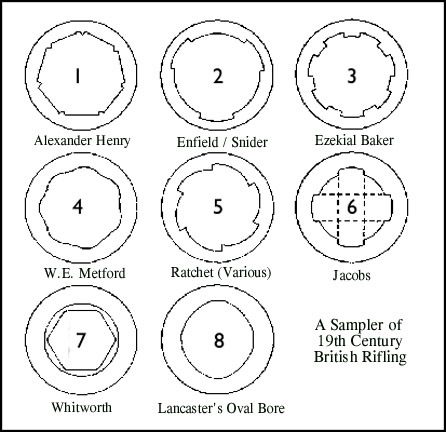 In the above image, you can see the comparison of different rifling styles among which is also the Lancaster oval bore. And that oval bore still retains the advantage of being considered as a smoothbore by the Russian law. Russian citizens over 18 years of age can obtain a firearms licence after attending gun-safety classes and passing a federal test and background check. The licence is for five years and may be renewed. Firearms may be acquired for self-defense, hunting, or sports activities. Carrying permits may be issued for hunting firearms licensed for hunting purposes. Initially, purchase is limited to smooth-bore long-barred firearms and pneumatic weapons with a muzzle energy of up to 25 joules (18 ft⋅lbf). After five years of shotgun ownership, rifles may be purchased. Handguns are generally not allowed. Rifles and shotguns with barrels less than 800 mm (31 in) long are prohibited, as are firearms that shoot in bursts and have more than a 10-cartridge capacity. Silencers are prohibited. An individual cannot possess more than ten guns (up to five shotguns and up to five rifles) unless they are part of a registered gun collection.